David Leatherby Jr. is driving. His son, Jeremy, is in the passenger’s seat, asleep. His daughter, Kimberly, is asleep on the backseat. It’s the middle of the night. They’re on a highway in the middle of a foreign country. Exhausted from several days pilgrimage in Rome, Mr. Leatherby, too, starts dozing off. Suddenly, to his horror, he sees that his rental car is about to slam into the back of an 18-wheeler. He turns the wheel, but it isn’t enough. The bumper of the truck shears through the right side of the car. When the car finally comes to a stop at the edge of the highway median, Mr. Leatherby turns to look at Jeremy. His son’s face has been badly disfigured, and he’s bleeding profusely. Kimberly is OK.
Mr. Leatherby pulls his son out from the passenger’s seat and cradles him in his arms. You spend your entire life as a parent doing everything you can to raise your kids and protect them and keep them safe, and in one moment…. He can’t think about any of that now. He knows he needs a miracle. He knows he needs the protection of Our Blessed Mother. He knows he needs the intercession of the saints. Today, more than six years later, Mr. Leatherby says he knows there was one saint in particular who was watching over him and his children: Saint Faustina Kowalska, the “Apostle of Mercy,” who in the 1930s saw extraordinary visions of Jesus that she recorded in her Diary. “Tell aching mankind to snuggle close to My merciful Heart,” Jesus told her, “and I will fill it with peace” (1074). Mr. Leatherby, of Sacramento, Calif., was not always inclined to turn to Our Lady and the saints for their intercession. But in 1990, he traveled to Medjugorje, in Bosnia-Herzegovina, where Our Lady has reportedly been appearing since 1981 (though the Church has not ruled on the apparitions). That trip changed everything for him. When he returned home, Mr. Leatherby began to incorporate his newfound faith in all aspects of his life, including in the rearing of his four children. His wife, Jennifer, also experienced a conversion over time. As for Jeremy, he became profoundly influenced by his father’s faith. After one year at the University of Notre Dame, Jeremy announced that he believed that God was calling him to become a priest. He went on to the college seminary, at St. Charles Borromeo in Philadelphia. In 2000, his final year in college seminary, his father invited him on a trip to Rome to celebrate the Jubilee Year of the Church. They would meet up with Kimberly, who was studying in Austria. After several days, it was time for Kimberly to return to classes in Austria. He remembers driving along a highway in Austria where cars travel at speeds upwards of 90 mph. It was about 3 a.m. when the accident occurred. It was a cold, dark October evening, and he’ll never forget it. First came the impact. Mr. Leatherby’s head slammed into the windshield and cracked the glass, and he blacked out for a moment. Their car finally stopped with its edge dangerously close to oncoming traffic. To add to the trouble, the car’s lights were smashed, making the car nearly invisible to oncoming motorists. “Dad, what happened? What happened?” Kimberly shouted from the back seat. “Kimberly, I hit a truck,” Mr. Leatherby responded. “Are you guys all right?” she asked. Mr. Leatherby looked over at Jeremy, who was dazed, but awake. “So I jumped up. I opened the door quickly on my side. I tried to open Jeremy’s door, but the car was smashed, and the door wouldn’t budge. All of a sudden a car goes by and misses us by inches. Mr. Leatherby pried his fingers through the cracked windshield and yanked the glass back and out of the way. He reached in and grabbed Jeremy and heaved him onto his shoulders while Kimberly ran across the highway to try to flag down a motorist to help. “I’m sitting there holding him,” Mr. Leatherby recalls. “Jeremy is just shivering. He’s awake, and he just keeps saying, ‘Dad, it hurts so bad. Dad, it hurts so bad.’ He is trying to touch his face, but I won’t let him. I’m holding him like a little baby, cradling him like a baby. Mr. Leatherby then tells his son that he must ask Our Blessed Mother for help, and that he must pray to the saints. “It’s the most amazing thing,” says Mr. Leatherby. “I was holding him, and all of a sudden I felt like what Our Blessed Mother must have felt holding the body of her Son. Then, a tremendous calm came over me. It’s hard to describe. But I was no longer anxious. I wasn’t worried. I knew this whole ordeal was for a purpose. I had this instant thought that Our Lady went through this — only worse. Just then, Kimberly flagged down a car. Mr. Leatherby picked Jeremy up and ran across the highway to her. “Jeremy was going into shock,” recalls Mr. Leatherby. Jeremy needed warmth. The driver who pulled over invited them to sit in his car, and he turned on the heater full-blast. They needed to call for medical assistance. The motorist happened to have a cell phone and happened to speak fluent English. The stranger also happened to have a blanket, which he used to wrap Jeremy. The medical personnel soon were tending to Jeremy, and the police started taking Mr. Leatherby’s statement. But Mr. Leatherby recalls pausing for a moment. “There he is: He has everything we need. A cell phone, a blanket, a warm car. He spoke English. And he was so generous to pull over, let us in his car, and let us bleed all over his car. This floored Mr. Leatherby. He knew someone was watching over his family. Jeremy’s vision was restored. The Leatherbys, including Jeremy and his mother, Jennifer, who had flown over, headed back to Sacramento where Jeremy would begin the first of many plastic surgeries. Just before the plastic surgeries were to begin, Bishop William K. Weigand of the Diocese of Sacramento, visited the Leatherby home. He had heard that Jeremy was going into surgery the next day, and he wished to administer the Anointing of the Sick. The Leatherbys knew little of St. Faustina at the time. Occasionally, they had prayed the Chaplet of The Divine Mercy. They owned a copy of her Diary. But the message of The Divine Mercy was not a huge part of their lives. A few days later, Mr. Leatherby went to his prayer group and told them of how the Bishop brought the relic. Her feast day is Oct. 5 — the same date as the accident. As expected, Jeremy went on to endure intense suffering as doctors sought to restore his face to what it looked like before the accident. 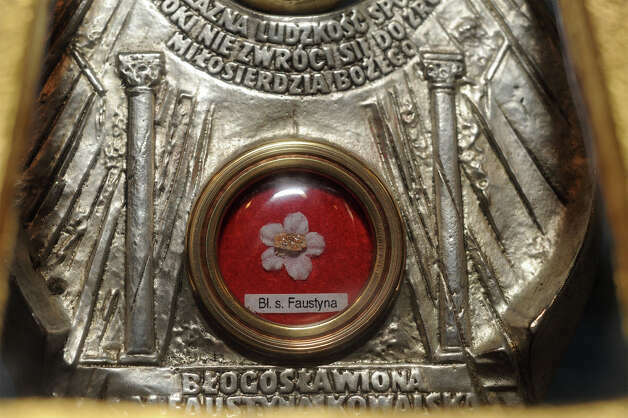 And all the while he had the relic of St. Faustina. In the meantime, Jeremy completed his course work from the seminary. He graduated first in his class in May, 2001. To celebrate and to offer thanks to St. Faustina for her intercession, Mr. Leatherby took his family to Poland to visit St. Faustina’s former convent in Krakow. 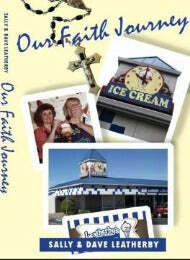 During a tour of the convent, a nun asked the Leatherbys why they had come. The nun proceeded to reveal how her sister and her sister’s husband also had recently gotten into a car wreck and how her sister’s husband suffered brain damage as a result. The doctors advised that he be taken off life support because he was unable to breathe on his own and was not expected to recover from his vegetative state. When the nun awoke, she immediately called her sister and said, “Do not unhook those tubes!” Her sister listened to her. Miraculously, the husband made a full recovery. He is fine today. He has no brain damage. His wreck, too, occurred on Oct. 5, 2000, on the Feast Day of St. Faustina, in the Jubilee Year — the year St. Faustina was canonized as the first saint of the new millennium! “For us, this was real confirmation that St. Faustina had been involved in all of this — that she was interceding for us,” says Mr. Leatherby. The sisters, who belong to the Congregation of the Sisters of Our Lady of Mercy, didn’t have guest accommodations like they do now. But they invited the Leatherbys to stay with them. The next morning, Jeremy went down into the sisters’ chapel to say his morning prayers. By the time Mr. Leatherby made his way down there, the chapel was filled with nuns singing and praying. “Pretty awesome!” Mr. Leatherby says as he recalls that morning. Today, Jeremy is a priest, in the Diocese of Sacramento, close to home. And his parents are thrilled. Our Lord told St. Faustina: “I arrange things” (Diary, 1147). Later, St. Faustina wrote: “Jesus gave me to know that even the smallest thing does not happen on earth without His will.” (1262). Mr. Leatherby says he and his family have come to understand this. That late night accident was no “accident.” Rather, it was an opportunity to draw closer to Christ, the very Incarnation of Divine Mercy, and to fully experience the love and peace of God. “We owe a lot to St. Faustina,” says Mr. Leatherby. “I’ve been given the gift to understand that the words of Jesus in the Diary are true — that every single tiny thing is looked after by God and His saints. I know many people feel God is so far away and wonder if He hears their prayers. He does. “I’ve also been given the gift to understand how important trust is,” he says. “As my daughter Kimberly says, we always attribute original sin to pride, but first it was a loss of trust in God. The devil got us to doubt God’s love for us.